My kids love space and all things planets and astronauts. I suspect a lot of kids feel the same (I know I did as a kid). 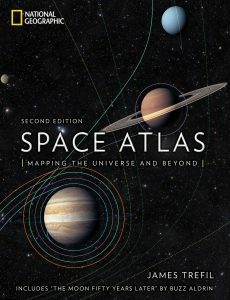 When I was offered the opportunity to review National Geographic’s Space Atlas, I was thrilled to do so. This volume is nothing less than stellar. The illustrations are vivid and informative. Who knew there was so much of the surface of Mercury mapped? As I flipped through it with my nearly-three year old looking over my shoulder, I appreciated how the book provides a nice visual aid in teaching about our solar system on a very basic level, but then it also provides a nice reference resource for middle schoolers and high school students. In addition to mapping out the universe, National Geographic’s Space Atlas also has information about the history of astronomy, the origins of the universe (The Big Bang), and the history of space travel. It makes for an outstanding reference resource for all homeschooling families. Posted on November 8, 2018 by Ronda Bowen	• This entry was posted in Book Reviews. Bookmark the permalink.